The product of three generations of the Mazzetti family, Mazzetti Balsamic Vinegar has become a milestone in the worldwide Balsamic Vinegar of Modena scenario since the company’s establishment in 1976. Now enjoyed in over 40 countries, Mazzetti Balsamic Vinegar of Modena recently launched in the UK for the first time. With a range featuring the brand’s Etichetta Bianca and an aged (Oro) expression, Mazzetti has collaborated with chef Theo Randall on a selection of recipes which incorporate balsamic vinegar as an ingredient rather than a mere accompaniment. 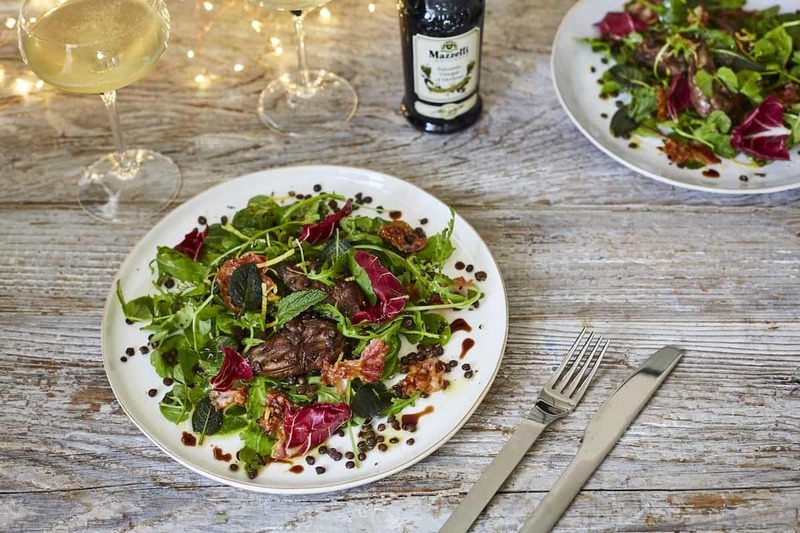 This warm chicken liver salad with mixed leaves, Umbrian lentils, pancetta, sage and balsamic yields plenty for two as a main course, or four as a starter – using Mazzetti Etichetta Bianca Balsamic Vinegar. Cook the lentils in a pan of simmering water for 20-25 minutes until soft. Meanwhile, trim off any greenish bits and visible sinew from the chicken livers, then set aside. Cook the pancetta in a frying pan until crisp. Remove with tongs and set aside to drain on kitchen paper. Add the chicken livers to the fat remaining in the pan and cook for about two minutes on each side until golden brown all over. Remove from the heat. Return the pancetta and the chicken livers back to the pan (don’t worry if the slices break up) along with the sage leaves. Add one tablespoon of the Mazzetti balsamic vinegar and season with salt and pepper. Toss everything together, then set aside. When the lentils are cooked, drain off all of the water. Add one tablespoon of the olive oil, a squeeze of lemon and seasoning. In a large bowl, toss the leaves and fresh mint with the remaining Mazzetti balsamic vinegar and olive oil. Add the lentils and mix gently together. Pile the lentils and leaves on the plates and place the chicken livers and pancetta carefully on top, with a drizzle of the Mazzetti balsamic vinegar. Mazzetti balsamic vinegar is available from Sainsbury’s stores nationwide, priced at £5.90 (Bianca) and £9.90 (Oro).